The dead are restless in the official trailer, poster and photos from The Spierig Brothers' Winchester. 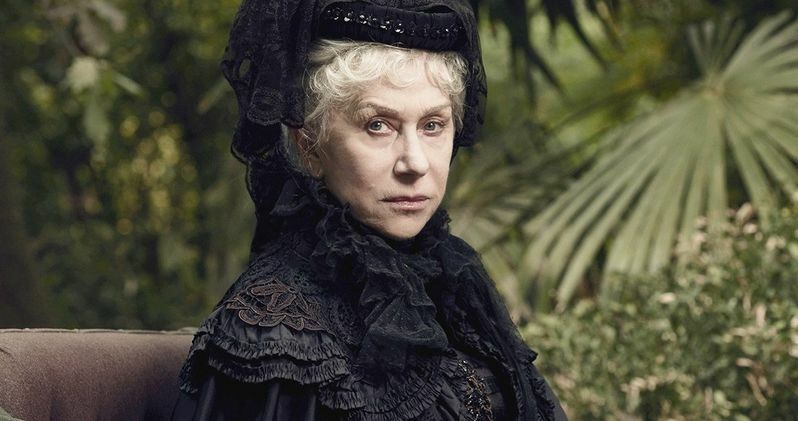 Inspired by the true story of Sarah Winchester (Academy Award-winner Helen Mirren), heiress to the Winchester fortune, who believes her family to be cursed and built the most haunted house in history to lay the vengeful spirits. The gothic thriller also stars Jason Clarke & Sarah Snook and opens in theaters everywhere Friday, February 2nd! On an isolated stretch of land 50 miles outside of San Francisco sits the most haunted house in the world. Built by Sarah Winchester, (Academy Award-winner Helen Mirren) heiress to the Winchester fortune, it is a house that knows no end. Constructed in an incessant twenty-four hour a day, seven day a week mania for decades, it stands seven stories tall and contains hundreds of rooms. To the outsider it looks like a monstrous monument to a disturbed woman's madness. But Sarah is not building for herself, for her niece (Sarah Snook) or for the troubled Doctor Eric Price (Jason Clarke) whom she has summoned to the house. She is building a prison, an asylum for hundreds of vengeful ghosts, and the most terrifying among them have a score to settle with the Winchesters. Sarah Winchester's husband, William Wirt Winchester, the treasurer of the Winchester Repeating Arms Company, passed away from tuberculosis in 1881, and upon his death, she inherited $20.5 million, plus 50% of ownership in the Winchester Repeating Arms Company, which gave her an income of $1,000 per day, which is the equivalent of more than $22,000 a day in 2017. She used all of this wealth to purchase an unfinished farmhouse in 1884 that would eventually become known as the "Winchester Mystery House." At one point the building stood seven stories tall, although the house is now four stories tall, with a number of oddities in the house such as stairs that go nowhere, which are attributed to Sarah Winchester not bringing in an architect for this mystery house. The building's floating foundation is said to have saved it from total collapse during major Bay Area earthquakes in 1906 and 1989. The Spierig Brothers (Jigsaw, Predestination, Daybreakers) direct from a script they co-wrote with Tom Vaughan, with Tim McGahan and Brett Tomberlin producing. THe supporting cast also includes Angus Sampson (Insidious, Mad Max: Fury Road), Finn Scicluna-O'Prey (True Story with Hamish & Andy, The Secret River), with CBS Films setting a February 2, 2018 release date, putting it up against jadslkfjsl. Take a look at the trailer, poster and photos for Winchester, courtesy of CBS Films YouTube.